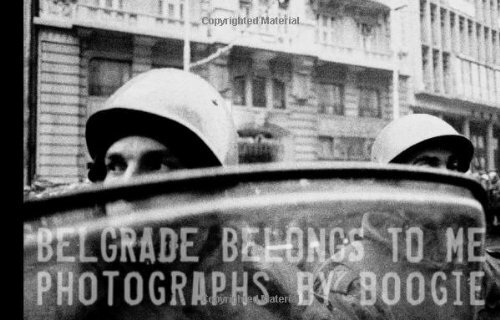 Born and raised in Belgrade, Serbia, Boogie began photographing rebellion and unrest during the civil war that ravaged his country during the 1990s. Growing up in a war-torn country defined Boogie’s style and attraction to the darker side of human existence. His archives reveal undeniable evidence of the evils that erode the urban space and unite humanity in the despair of impoverished lives. Belgrade Belongs to Me, his third powerHouse Book, shows the city from the inside as the former Yugoslavia began its rapid disintegration into war and the slow resurrection of a people who have fought for centuries for their survival. Boogie does not spare the spectator any social taboos as he documents the daily struggles of the marginalized people whose lives he infiltrates completely, taking us deep into worlds traditionally closed to outsiders. Whether documenting neo-Nazis or gypsies, police or protesters, or the working class people of Belgrade, Boogie’s work reflects his respect for his subjects, defying the glamorized stereotypes of urban life and revealing the phantoms that haunt the modern metropolis.